Tuesday night was unequivocally a good night for Democrats in Virginia. Ralph Northam won the governorship by what appears to be the largest margin of any Democrat since at least 1985. The lieutenant governor and attorney general candidates each won by about six percentage points. Most surprisingly, the Republicans look as though they may lose control of the House of Delegates. This was an outcome that very few people thought was possible going into this election – most thought that Democrats would make gains, but no one thought they would be this extensive. Nothing in this piece should be interpreted as detracting from those gains. This was absolutely a stellar outcome for Democrats. Republicans should be extremely worried going into the 2018 elections, if they weren’t already. So why are the 2017 results seen as such a surprise? Some of it is the House of Delegates outcome (which I discuss below), but some of it is that the race for governor did seem to be tightening in the final weeks. This set expectations for a very close finish. But that would have been extremely unusual, given the national environment, and in the end, the fundamentals won out. You could actually see this, with a sharp uptick in Northam’s numbers in the last batch of polling. I said at the time that this was probably the final group of undecideds breaking heavily toward Democrats, much like we saw in 2014 with Republicans. I think this is probably right. We should, however, keep a few things in perspective. Ed Gillespie ran about two points behind Trump’s showing, and the rest of the Republican ticket ran about a half point behind Trump. This isn’t good news for Republicans, but I’m not sure that it is clear proof of a tectonic shift, either. There isn’t much to say here, other than news reports were flying in the runup to the election that Democrats were spending heavily to try to flip the House of Delegates. We will learn more in the forthcoming weeks, but I think a lot of Republicans were probably caught flatfooted. This will be tougher to do in the 2018 elections (although we say that in every wave election, and inevitably candidates are still caught flatfooted). We now turn to the House of Delegates. Again, this was a shocking result. But should it have been? I think there was a bit of “unthinkability bias” at work. Some history is in order to understand this. When Republicans drew the House map, it was widely thought that they had drawn one that Democrats could not win on. This seemed to be validated by the fact that Republicans immediately ran up supermajorities in the House. This interpretation was probably correct, at least as the map was initially drawn. But, simply put, the map moved out from underneath Republicans while no one was looking – or, while no one was willing to adjust their views in light of the facts on the ground. If we use presidential vote numbers to calculate an efficiency gap (EG) score, which is the measure of gerrymandering before the Supreme Court right now (using presidential votes avoids the problems of handling races where a candidate is unopposed, and it helps control for the candidate and campaign effects that make the metric being utilized so problematic), the House of Delegates map had an EG of -.16 in 2012. Using the 2016 data, that gap falls to -.11. You can think of this as the map losing about a third of its partisan advantage over the course of four years. I suspect that if the 2008 data were available, we would see a substantially larger gap than we saw even in 2012. We frequently see this with gerrymanders: Parties draw them to their advantage in the first year of implementation, but then time takes its toll. Partisan loyalties and attachments change, and the map’s strength is eroded. This combined with increased polarization at the national and state levels to create a catastrophe for Republicans. Consider the following chart. It shows all the seats where Hillary Clinton’s vote share was between 40 and 60 percent of the vote last year. The left three columns represent the delegate’s name, the delegate’s party, and the party that won the seat. The right three columns represent Clinton’s share of the two-party vote, Obama’s share of the two-party vote, and the Democratic candidate’s share in the 2017 elections. 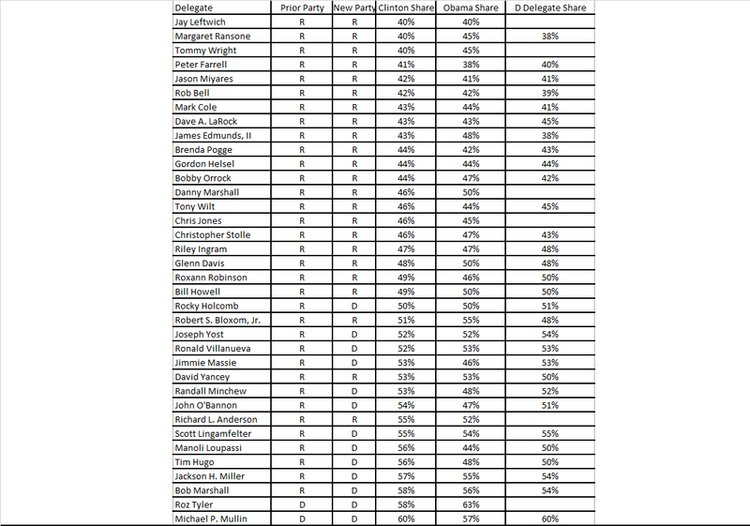 Data were helpfully compiled by Daily Kos elections. So what does this show? 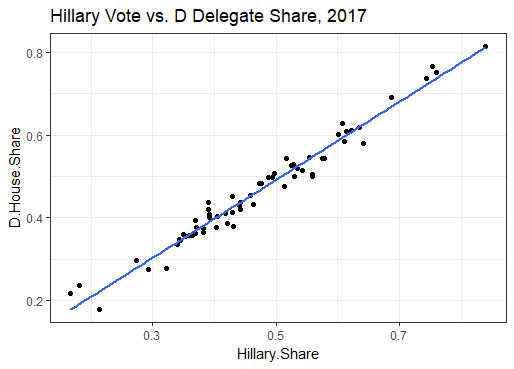 As you can see, there were a large number of Republican delegates occupying seats that Hillary Clinton won (there were four in seats that Hillary Clinton won by more than 20 points; those all flipped). Many were districts that Barack Obama had won by narrower margins, or had actually lost outright. These are basically the districts that flipped. A handful of these Republicans have held on to their seats, but for the most part, this election was about achieving perfect separation between Clinton districts and Trump districts. Because the map has moved toward Democrats, especially in suburban districts in Northern Virginia and the Richmond suburbs, this worked to Democrats’ benefit. So what we saw in Virginia is actually more normal than it looked. Democrats flipped a number of newly Democratic-leaning districts, and the top of the ticket ran a bit ahead of Clinton. Should this comfort Republicans? Probably not. There are 23 Republicans in Congress who presently occupy districts Clinton won, which would leave Democrats just one seat short of what they need to win a majority if they flip next year. There are 32 Republicans in seats Clinton either won or lost by fewer than two points. That would give Democrats a majority just shy of where they wound up in 2006. In other words, the House of Representatives is very much in play for Democrats, unless something changes at the national level. 4. Does this work in reverse? Finally, we should ask ourselves: Does this work in reverse? We don’t really know what would have happened to a Democratic incumbent in a district that Hillary Clinton lost – Republicans held all of those districts. But there are 12 Democrats in Trump districts at the federal level, and a number of Democratic senators in Trump states. If this sorting is a one-way street (and I can think of good reasons it would be), then those Democrats have little to fear. But if the sorting is ongoing, then we could see some results that limit Democratic gains, and could even reverse them in the Senate.